This Well Water Filtration System includes a huge 7" Terminox™ ISM Filter and a 30,000 Grain Capacity On Demand Water Softener and Reverse Osmosis System to provide you with clean soft water throughout the entire house. No matter what problem you have with your well water, we have a system for you. Be sure to check with a water quality technician by phone or e-mail to be certain you are ordering the correct treatment system. 7" Terminox™ ISM Filter includes an oxidizing mineral, like a rock, that comes out of the ground. It NATURALLY oxidizes things such as iron and sulfur. It is almost like it is hitting it with air. It turns oxidized items into a sediment form, which cannot pass through its dense mineral bed. Unlike birm filters which require air injection or other filters which require chlorine, salt or hazardous chemicals such as potassium permanganate, it is environmentally friendly and requires no additives at all. It periodically cleans itself in the middle of the night and requires virtually no maintenance. You just "Set it and forget it." It removes iron, sulfur, manganese, dirt, sediment, turbidity and harsh chemicals such as chlorine. As the mineral is a catalyst it virtually never requires removal and replacement. The average Terminox™ filter should last you 25 to 35 years. 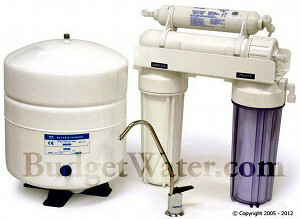 It is state of the art Technology that is offered exclusively by WaterFiltersOfAmerica.com. These units are most effective on a pH of 7.5 or higher. To properly size your unit you must know your flow rate and pH.